The house has four bedrooms, two bathrooms and its own pool. It is located just a few minutes’ drive from all of Florida’s attractions: Disney World, Universal Studios, Splendid China, Sea World etc. It is the ideal starting point for day trips to the Atlantic coast or the Golf of Mexico. Further Details: The vacation home has one bedroom with a kingsize bed, a second bedroom has a queensize bed and one bedroom with two twin bed is decorated as a little princess room. the forth bedroom with 2 twin bed is decorated as a boys ball room. To make your Orlando visit the most wonderful vacation can be a challenge - to know which parks you want to visit and make sure you have the right tickets, saving time and money. The parks are divided into two areas: Disney World - consists of different areas and parks (Epcot, Magic Kingdom, Hollywood Studios, Animal Kingdom, several water parks, Downtown Disney Marketplace). These are to visit, depending in many combinations with Disney tickets you want to stay and what to see and experience. Universal Studios, Islands of Adventure, Sea World, Aquatica, Busch Gardens and Wet'n'Wild can all be visited with the 'Flex Ticket '. Discovery Cove - the ultimate dolphin experience - Tickets can be purchased directly at Discovery Cove - but must be booked in advance. But is there also in combination with Sea World. I look forward to get in contact with you. Thanks for your 5 star revenue. We are happy if our guests like it to stay in our house and they feel comfortable. Hopefully see you and your family soon again. We could not have been happier with this home! It had everything we needed for our 6 day stay. It was clean, comfortable, and roomy. The location was amazing. We spent our whole stay visiting the Disney parks and the house was a quick 10 minute drive. We never experienced much traffic, even though we were there over a holiday weekend. It was also very close to Walmart, which was great for a few essentials that we left at home. I highly recommend it! Thank you for taking the time to leave such a nice review and we are pleased you and your family had a great time. We look foreward to hearing from you again. 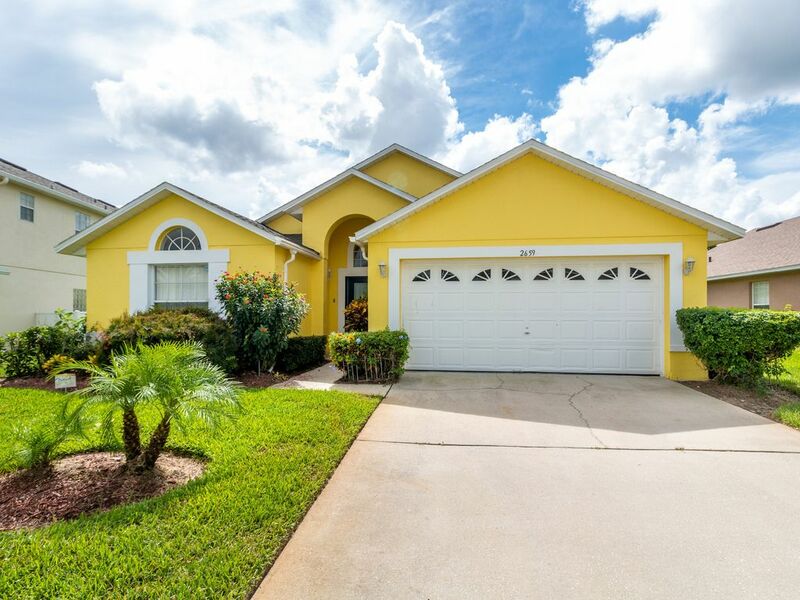 Fantastic property ideally located for all the parks literally 20 mins to parking at Disney. Everything you could need in the villa. Small negative games room could do with an update. But otherwise perfect. Thanks for your review. Hopefully see you soon again. Loved every minute of our stay. The villa was spotlessly clean and had everything you could need. Been to other villas and by the time you clear the breakfast dishes into the dishwasher you had run out of glasses or plates - not here, it has loads of everything you need. Location was perfect for the parks and for shopping at Walmart. Pool and games room were a real winner with the children. Contact with the owner was great, always answered quickly and was very helpful. Really hope to return. Many thanks for letting us rent your home. Your are always welcome. You were great guest and we will be happy if you stay in our vacation home again. Overall it was a very comfortable home away from home. Nice neighborhood, close distance to Walmart and Disney World. Minor issue - needs to upgrade entertainment. Pool table edges loose, electric in garage not working and light fixture in pool doesn’t work or the electric plugs outside. Overall a great place to stay in. Definitely will rent again in the future. My family and I stayed at this house for a week. We love the house and it's close proximity to all of the parks. There are also stores and restaurants very close. The pool was great after a long day at the parks, and my two grandchildren and son-in-law loved the game room in the garage. The house has great amenities but it does not have many necessities. We had to go to store and buy extra paper towels, toilet paper and Kleenex. The kitchen had every kind of knife and forks, pots and pans, dishes and glassware but no salt and pepper or any spice you might need to cook with. We have stayed at other homes around the country and this is the first one that did not have spices or dishwashing soap or even hand soap only a very small hotel type of bar and only one in each bath. Also we put out the garbage on the days Home Away advised but there were no extra bags to put in back in the cans in the house so we had to buy them as well. All in all it's a great home and we loved it. Just be prepared to buy necessities. We are pleased that you enjoyed the stay in our vacation home. So far no one has complained about missing parts. You rent a cation home and not a hotel room. Our Management Company supplies the house with "starter supplies." The starter supplies include a roll of toilet tissue, dishwasher tabs, soaps for each bathroom and 2 trash bags for the kitchen. The supplies are intended to get you started at the house so there is no need to rush out on your first night to the store, and you would get more of your favorite brands after going to the store. We also have no spices or food in the house as no one knows how old these are or whether they are contaminated. Your are always welcome and hopefully see you soon again. NOTE: Some owners state their villa is only 5 minutes from Disney, but many are not. View our Location at Rolling Hills and its close proximity to the Parks. Golf: Golf: Especially in the U.S. is playing golf without a club affiliation an issue. Of a total of 17 485 golf courses in the U.S. are 12 833 public. With 825 out of 1363 public places Florida is purely 'golfers' seen a more attractive destination. Half a mile south of our house, on Old Lake Wilson Road/CR545 was opened in January 2001, the Mystic Dunes Golf Club, an excellent facility with a very challenging course. Celebration Golf Club, Orange County National, Falcon's Fire Golf Club, Orange Lake Golf, PGA Championship, the four places on the Disney grounds - to name only a few golf courses - you can from our house, within 5 - 15 minutes.